The passenger trains are air-conditioned, have electrical connections (220 V) and WiFi. 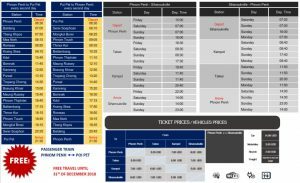 Tickest can even be booked online with Royal Railway Cambodia here. The leisurely journey by train is a very special experience through the impressive landscapes of Cambodia, as the video published by Royal Railway Cambodia on its website demonstrates, even if it is just a freight train.